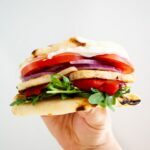 This is the best halloumi sandwich! 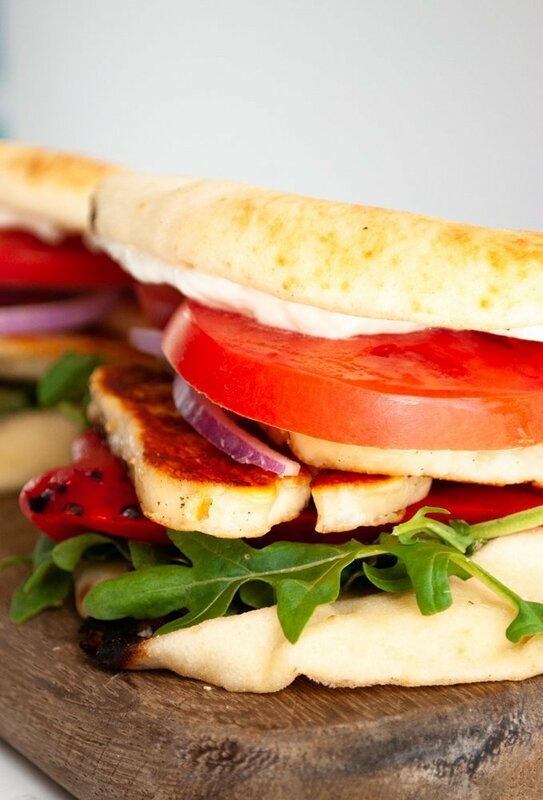 Perfect pan fried halloumi, roasted red peppers, arugula, sliced tomato and red onion come together in this refreshing naan bread sandwich with tzatziki. Let’s talk about halloumi friends. If you haven’t tried it yet you are in for a treat! If you are a cheese fiend like me, It just might be your new favourite thing! Specifically, I think you need to try it on this sandwich. It’s perfect. I can’t stop talking about it. James can’t either. Salty, sweet, tangy, crispy, crunchy – this sandwich has got it all from flavour to texture. Halloumi is a semi-firm cheese (kind of like a cheese curd) that has been brined that is native to Cyprus. The most notable thing about halloumi, aside from its salty flavour, is its high melting point which allows it to be fried or grilled while keeping its shape. Look for it with the cheeses in the deli section of your supermarket. The traditional halloumi sandwich consists of fried halloumi with sliced tomato and onion. I’ve added some roasted red pepper to the sandwich because I just love it and topped it with tzatziki because, well, tzatziki. To house it all, I’ve chosen mini naan rounds because I love how light and soft they are, but if you can’t get those where you are any nice soft roll or even pita bread will do. Start by preparing your halloumi. Because it is a brined cheese, it will be a little moist when you take it out of the package. 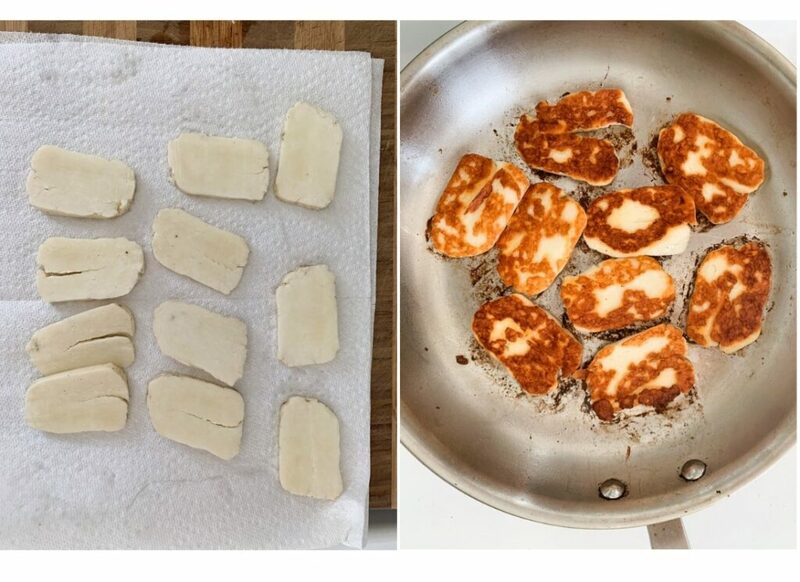 We want to get a nice golden crisp on the halloumi so the first thing I do is slice the cheese about 1/3 of an inch thick and then I lay the slices out on a piece of paper towel to absorb any excess moisture that will get in the way of achieving that nice crisp exterior. Heat a large saucepan to just below medium heat. Brush the top side of the halloumi slices with olive oil then place them oiled side down onto the pan. Brush the top side of the cheese with olive oil. Allow the cheese to cook for 3-4 minutes per side or until it has turned a nice golden colour. When you like the colour of the bottom side of the cheese, flip it and cook the other side until it is golden as well. 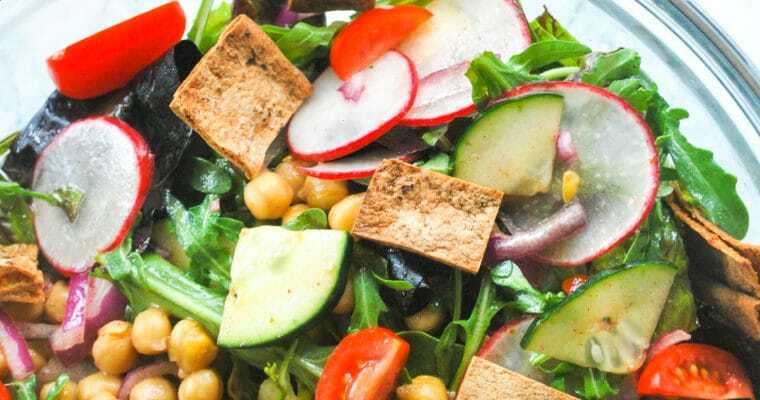 To put the sandwich together, pile on the arugula, fried halloumi, tomato slices and red onion then slather the top piece of the mini naan bread with tzatziki. Pan fried halloumi cheese with roasted red peppers, tomato, onion and arugula on mini naan bread with tzatziki. Heat a large skillet to just below medium heat. Remove the halloumi from its package and slice into 1/3" slices. Using a paper towel, pat off any excess moisture from the halloumi slices. Place the halloumi slices in the skillet and cook on each side for 3-4 minutes or until the halloumi takes on a nice golden crisp on each side. 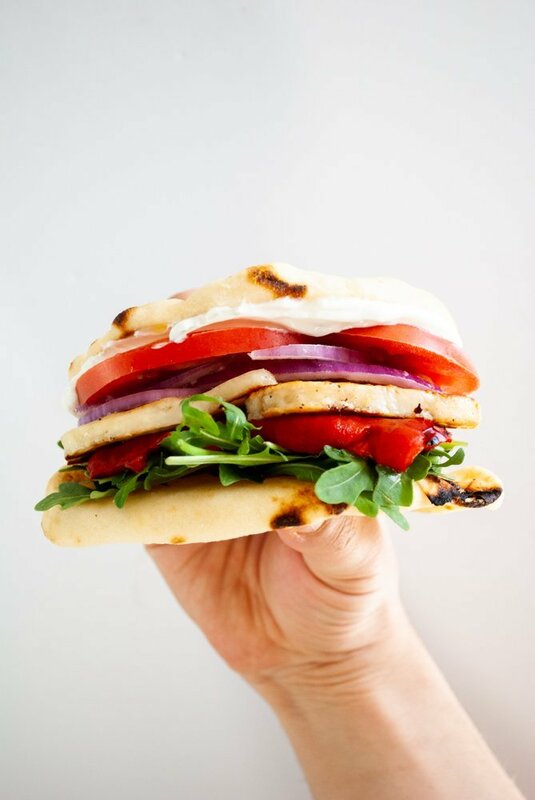 Build your sandwiches by adding arugula, roasted red pepper, the fried halloumi, tomato slices and red onion to the naan rounds. 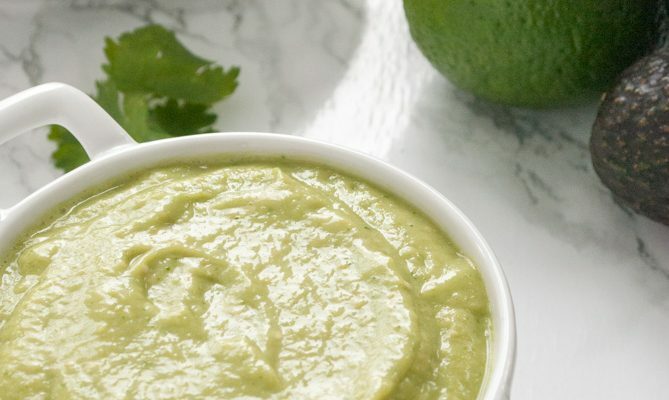 Top with tzatziki and enjoy!